A collection of low carb recipes that we really use. Eating low carb doesn't mean eating just meat and eggs. There are so many possibilities that eating low carb can be delicious and fun! As you can tell, these recipes call for ingredients that are probably in your kitchen right now. I created this recipe from a 'regular' one. My husband calls it 'low carbing' them. These don't always work out very well but this one turned out fantastic! I figure there are about 4 carbs per muffin when all is said and done. I ate one warm from the oven and they are really good but if you wait until the next day, they are even better! I think it gives the almond flour time to meld with the cream cheese. 1/4 C almond flour - next time I might just used regular flour since I didn't really like the way this part turned out. Strawberries cut into small chunks. Preheat the oven to 400 degrees. Layer the ingredients into the muffins cups. This will make about 12 muffins. First add about a tablespoon dollop of batter. Next put about a teaspoon of cream cheese filling. 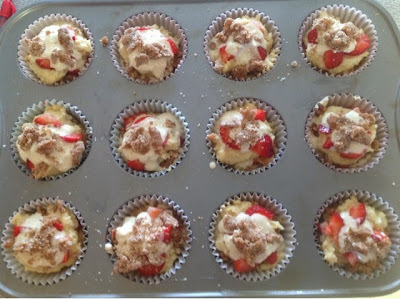 Then top with a few strawberry chunks and a bit of streusel. Repeat one more time and pop in the oven for 20-25 minutes. I think there are about 5 grams of carbohydrates per muffin. when you say cream for the batter, do you mean heavy whipping cream? Yes. That is what I always use. Nutrition information app. 12 muffins come out to 10 carbs per muffin, 3 fibers, for 7 net carbs each. I used heavy whipping cream. How much splenda would I use instead of packets? I completely agree. How do you feel about stevia? 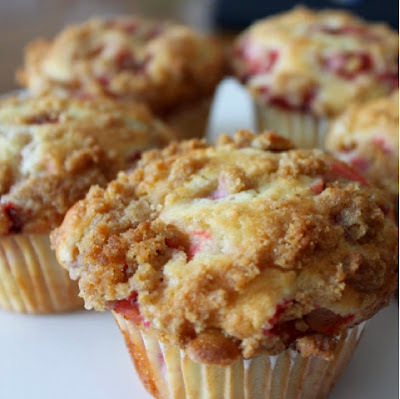 Most muffins do stick to the pan which is why I always use paper cups. Sorry I did not say that in the instructions. Also, no, I did not put the carb count on this recipe. Basically there are carbs in the 2 cups of almond flour and whatever sugar substitute you choose. So 52 grams for the whole recipe. About 5 grams of carbs per muffin. I came up with 12 total carbs-10 net carbs. More than I was thinking. But DELICIOUS! And great for a special treat. how long will these stay fresh and can I freeze them to keep them for longer? I might be sending this text for second time. I use truvia instead of Stevia. 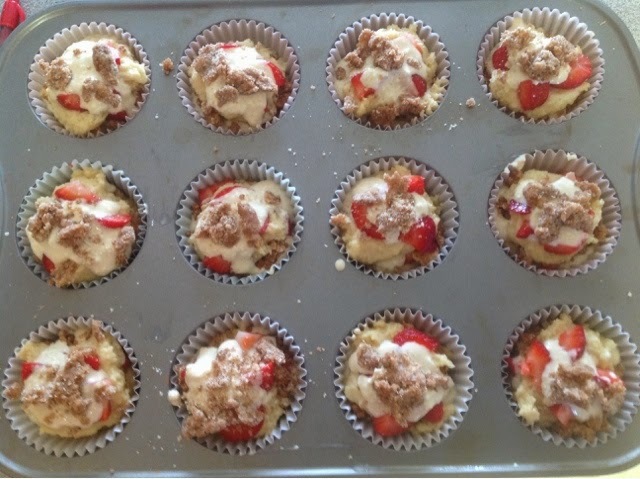 Did you really mean to use two topings on top of each other, of the cake Mix + fruit + cheese+ Streusel? I made these this morning and they were so good! I’m sad I had to cut the recipe in half because i didn’t have enough almond flour! I did use flour for the crumble and it was good! In the first bite I didn’t get any cream cheese and I remembered that I’m not that fond of almond flour but once I got the cream cheese in my bite, I was in love! They’re so good!